SEO for Bing: What’s Important, What’s Not? 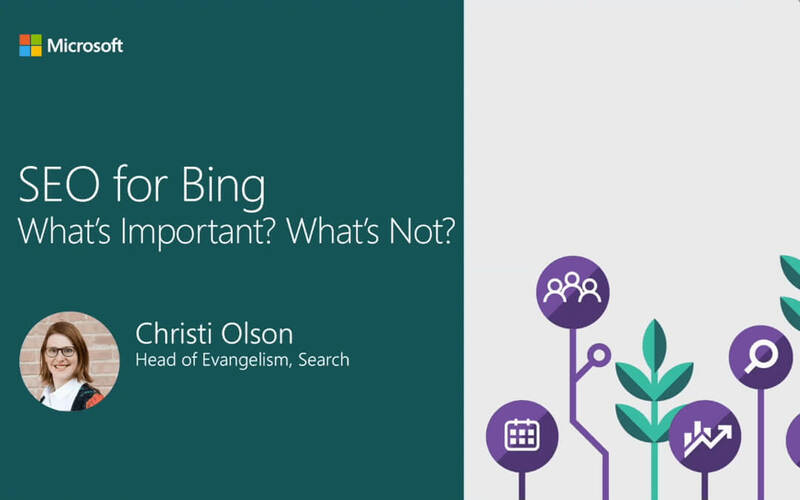 Christi Olson, Head of Evangelism for Search at Microsoft, walks you through all you need to know about SEO for Bing from an intriguing standpoint: what’s important for Bing as a search engine? What is important for a searcher? And also, what is important for you as a website owner or an optimizer? By requiring to view this webinar, you accept to subscribe to our monthly newsletter and receive fresh articles and tips on SEO and content marketing. In this webinar, Christi Olson will give you an insider’s view on Bing’s tools for SEO, Bing’s new functions and much more. After this webinar you will have a clear overview on how Bing works and you will be able to optimize your website with Bing-specific SEO techniques. What is the goal for search engines? Find below Christi’s presentation in PDF. It’s rich of tips, examples and good practices: download it and skim it anytime you need. It’s free! In the latest weeks, Christi published on Search Engine Land a compete guide on how to use Bing Webmaster Tool, which is a great introduction for beginners and also a goldmine of tips and resources for those who are already using this platform. Christi is the Head of Evangelism for Bing at Microsoft and is on the Board of Directors for SEMPO and the University of Idaho School of Business. For over a decade Christi has led Digital Marketing teams at Microsoft, Expedia, Harry & David, Pointmarc and Point It. She is passionate about search marketing and has spent her career helping businesses solve their marketing challenges. She has been recognized by PPC Hero and her peers as one of the top 25 Most Influential PPC Experts in 2018, 2017, 2016 and 2015. Are you ready for the next SEO?